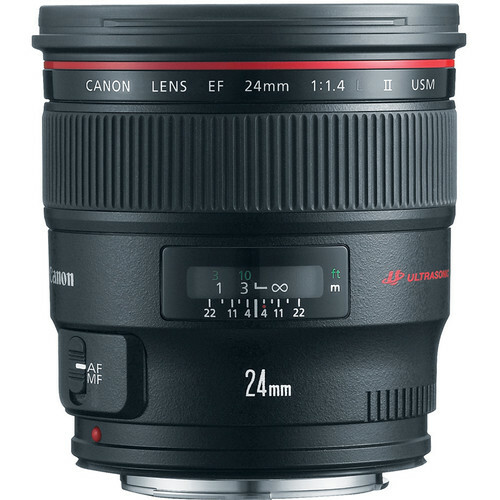 The Canon EF 24mm f/1.4L II USM is a L-series lens characterized by a robust physical construction and sophisticated optical design. Two ultra-low dispersion elements help to control chromatic aberrations and color fringing while a pair of aspherical elements reduce spherical aberrations and distortion for high sharpness and clarity. Individual elements also feature a Sub Wavelength Coating to suppress lens flare and ghosting for improved contrast and color neutrality in a variety of lighting conditions. Besides the optical attributes, this lens is also distinguished by its fast f/1.4 maximum aperture to benefit working in low-light conditions for controlling depth of field. Additionally, this lens sports a ring-type USM for quick and quiet autofocus performance and full-time manual focus override, and an internal floating focus mechanism also helps to maintain consistent image quality throughout the entire focusing range. Wide-angle prime Canon EF 24mm f/1.4 lens is designed for use with full-frame Canon EF-mount DSLRs, however can also be used with APS-C models where it will provide a 38.4mm equivalent focal length. Fast f/1.4 maximum aperture greatly benefits working in low-light conditions and also affords increased control over depth of field. Two ultra-low dispersion (UD) elements are used to reduce chromatic aberrations and color fringing for improved clarity and color accuracy. Floating internal focusing mechanism helps to maintain consistent image quality throughout the focusing range, from 9.8″ to infinity. Rounded eight-blade diaphragm contributes to a pleasing out of focus quality that benefits the use of shallow depth of field techniques. 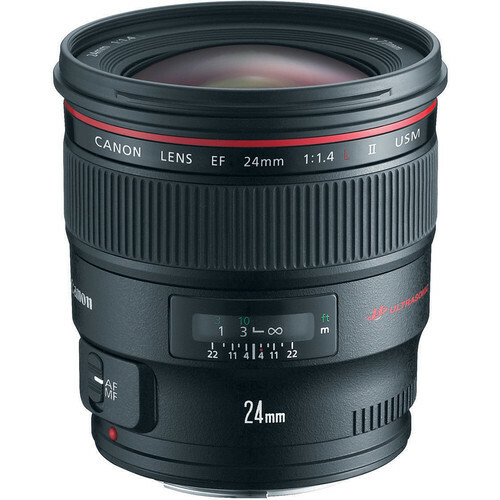 Rent the Canon EF 24mm f/1.4L II USM Lens from Deck Hand Camera Rentals today!